I listened to my first Claire Contreras book a while ago, and I knew I needed more. And The Player was a lot of fun! I always like it when the Player has to work for what he wants! Ahhh! What a fantastic listen The Player turned out to be! It was amusing to see two people from completely different worlds slowly fall for one another! The player had to chase the girl, which in Warren's case, he wasn't used to doing. And Camila, she really didn't want anything to do with him initially, but his persistence wore him down! Warren was attracted to Camila from the first moment he saw her. She was fighting for her livelihood and those of her friends. He liked how feisty and driven she was to get what she needed! She also had no idea of who he was and treated him like any other guy that would hit on her. Camila had a tough time growing up, and was not going to allow some big company drive her out of her home and neighbourhood. Even some guy, thinking that he's above everyone was not going to win her over. But each time she went out with Warren, she began to warm up to him. It was sweet to see their relationship turn physical and that she was willing to let Warren into her life. I loved seeing Warren squirm! He knew what he wanted and kept pulling out the big guns to win over the girl. I liked that Camila was unimpressed, and she would then show Warren New York on her budget. To see him uncomfortable, but willing to endure it all for her, was cute. I really enjoyed the narration by Zachary Webber and Megan Tusing, they were both great to listen to. Warren had lived over in England for a number of years, so had a bit of a British accent which was done well throughout the story. 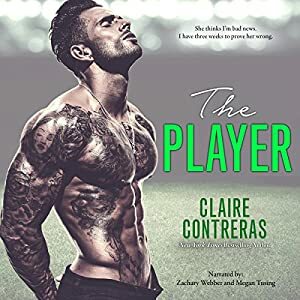 I liked the way that Claire Contreras wove the story too, and allowed the relationship to develop gradually, and threw in some hurdles to spice up the story. This is the second book I've read by Contreras, and I'm excited to read more! This was a great end to a friends date! I knew Warren couldn't let the night end without overstepping the rules! We smiled at each other once more before she closed the door. I’d kept my mouth shut because I didn’t know what to say to her, but the moment she turned around and started to unlock the door to the building, I bolted out of the car and jogged toward her. Camila turned around as I reached her. “I’m sorry,” I said, earning a confused look from her as I cupped the back of her neck and pulled her face to mine. Camila gasped as my lips crashed down on hers, her hands flying to my chest, but not pushing away. She grabbed a fistful of my shirt and pulled me closer, as if any space left between us was too wide.